This is one of my favorite quotes. I'm notorious for living in the past and dwelling on situations when they're over. My husband will tell you that I've said, almost daily, how much I wish we stilled lived in Europe. While I wish this wasn't the case, it is. But instead of constantly dwelling on the fact that I'm now living back in California (a very lovely place to live) and not in Europe, I'm embracing the fact that my family and I had the opportunity to live in Switzerland in the first place. 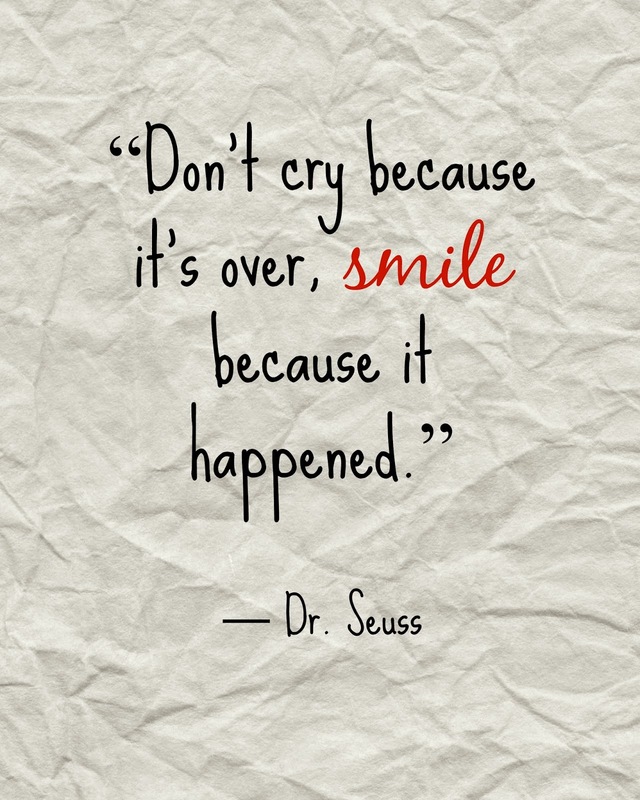 I will no longer be sad that that part of my life is over, but smile that it happened at all. This is so very true when it comes to death and the loss of a loved one or pet. While it's very easy to focus on the loss of someone or something, we should try to focus on the idea that we were so lucky to have known the people we've lost or experienced the adventures we have. I for one am working on this everyday and do have to remind myself of this. Even in the saddest situations and weirdest moments, I will try to see the beauty and privilege in them...& just smile. I would love to hear of some of the things that you might be struggling to get over or simply smile about.